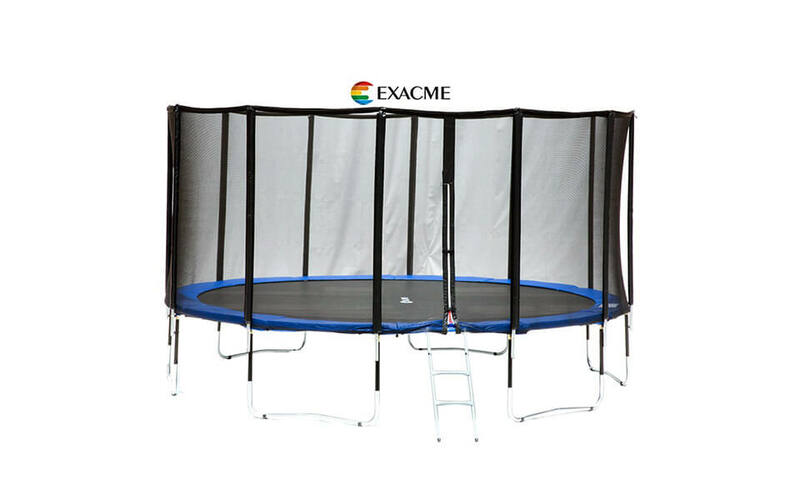 As we received this trampoline for review & test we were pleasantly surprised that time needed from unpacking to testing was less than 5 minutes. 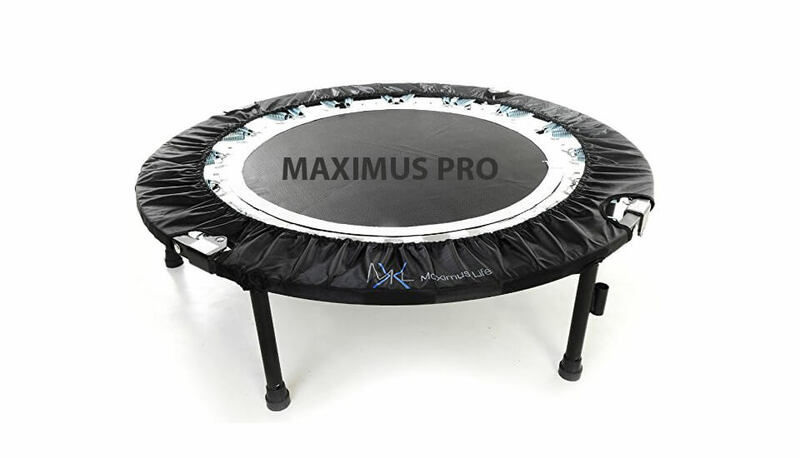 Screw legs, put and secure padding, bolt on handlebar with 4 screws and you are ready to surprise your kid with brand new kids mini trampoline. 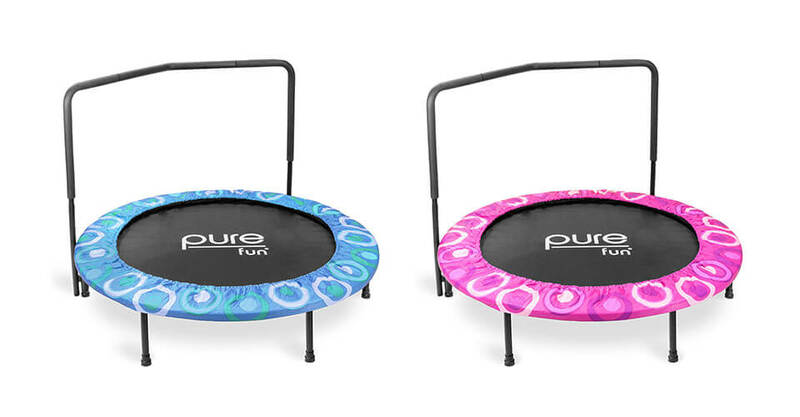 Beside standard color – yellow-blue, this trampoline is available in limited edition lime-purple & red-blue editions. 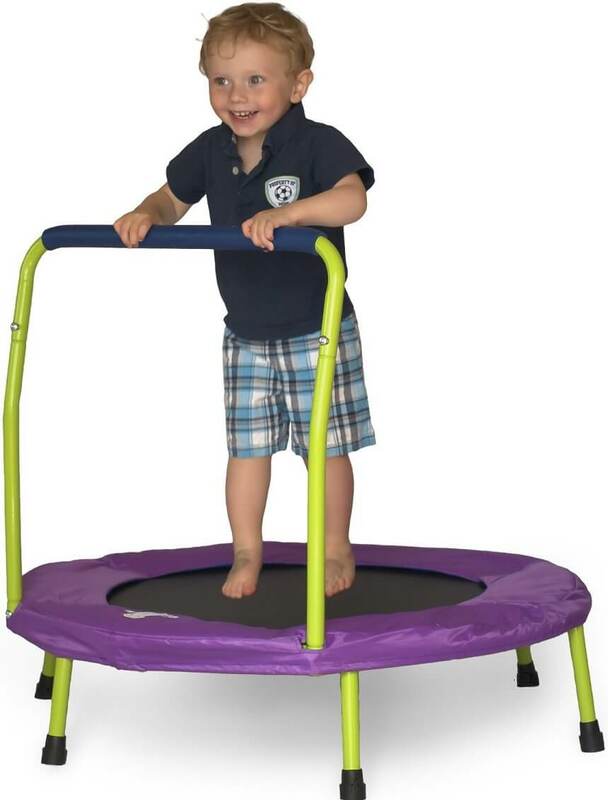 Fold & Go is mini trampoline for kids measuring 36-inches in diameter. 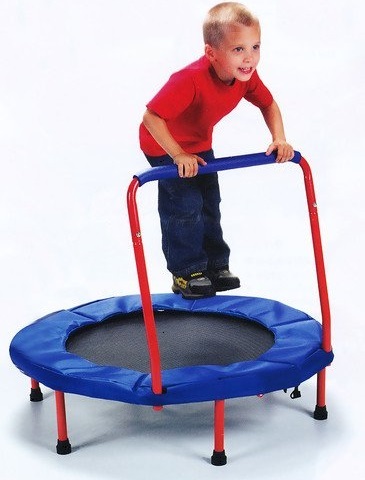 It comes with stability bar which helps smaller children to feel safe while jumping on this kiddie trampoline. Stability bar is approx. 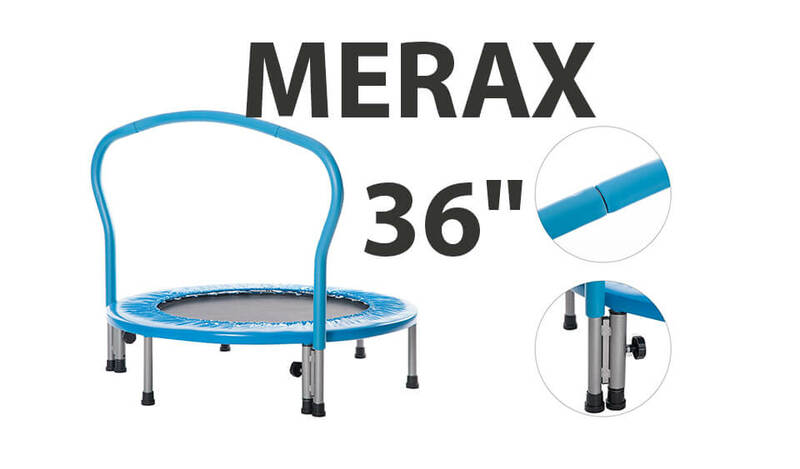 23.5″ tall when measured from trampoline mat and 32″ tall when measured from the floor. 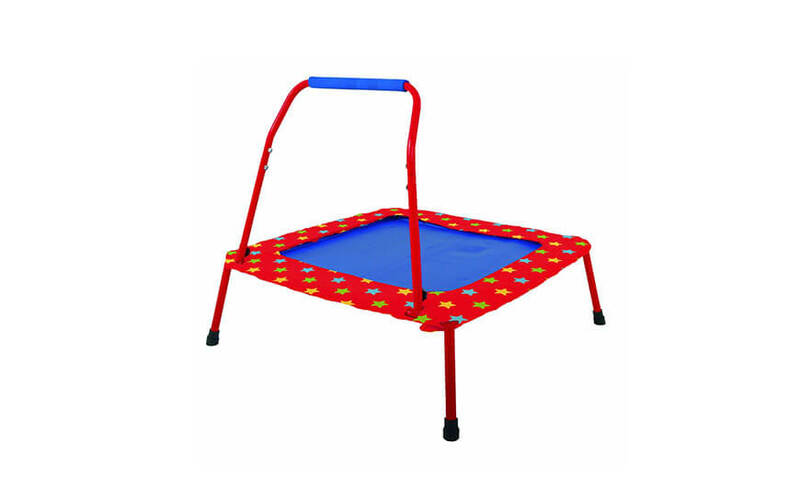 Foldable steel frame is connected to slightly curved legs making it very stable. There is 6 legs in total which are made of steel and are easily screwed into designated holes. 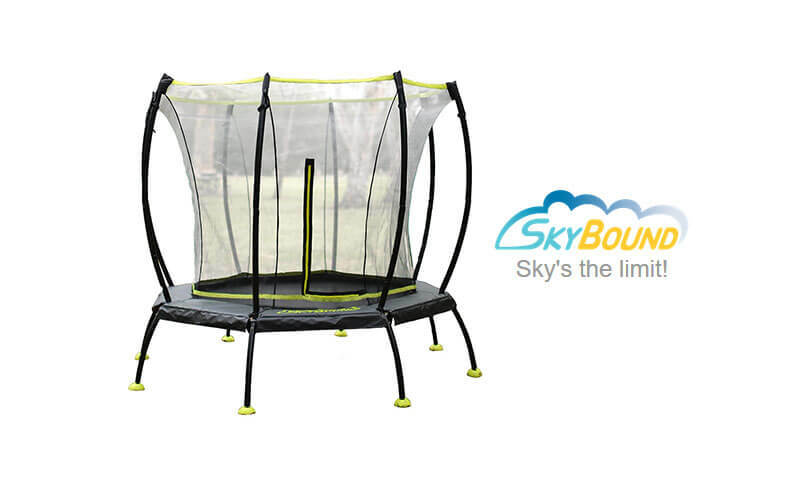 Frame is strong and sturdy enough and can bare a bit more than designated weight limit. 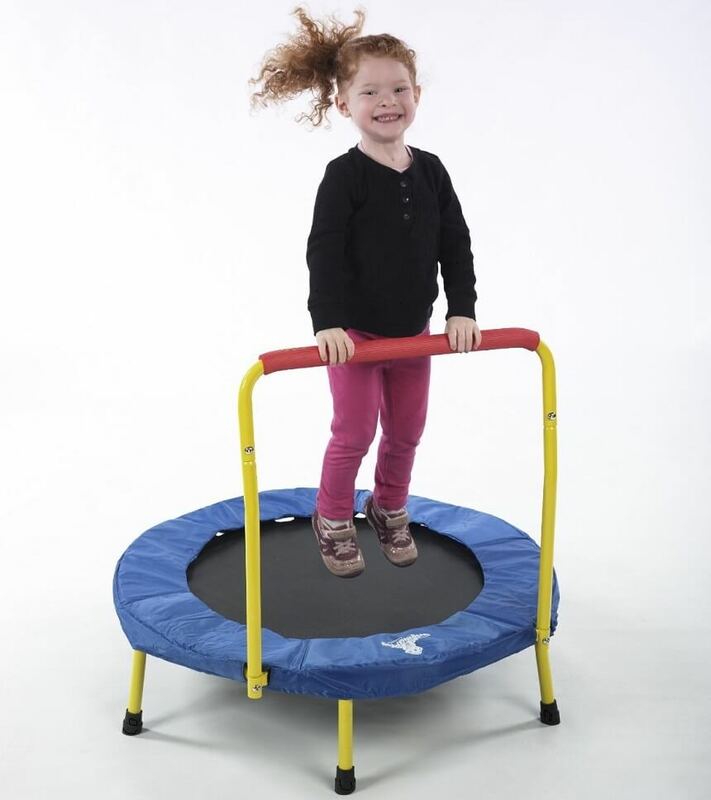 Fold & Go Trampoline uses wide elastic bands instead of metal springs. 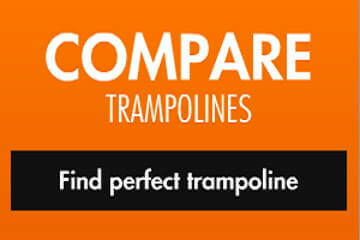 Bands are wider and safer than most commonly used bungee cords, and provide nice, smooth bounce. 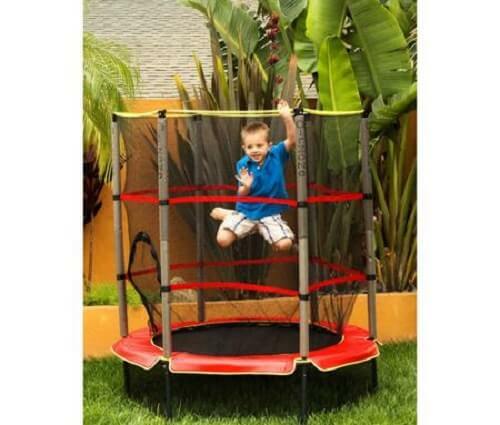 This type of springs is generally safer for use by smaller children! 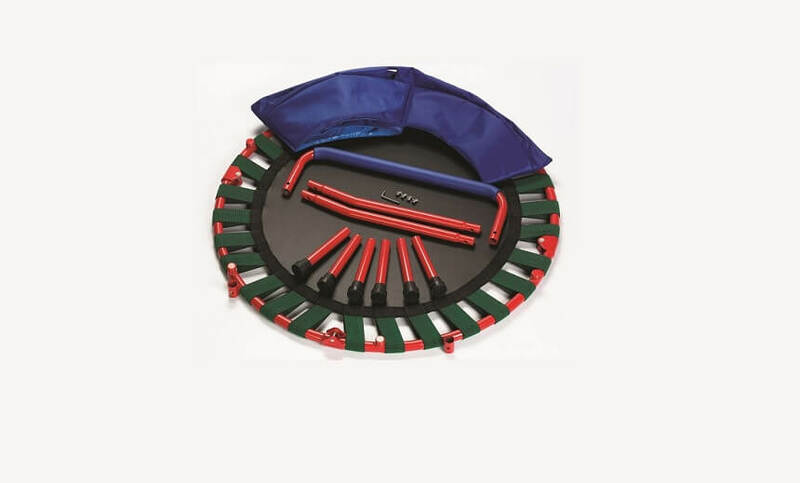 Mat is standard woven polypropylene, connected to frame via wide elastic bands. 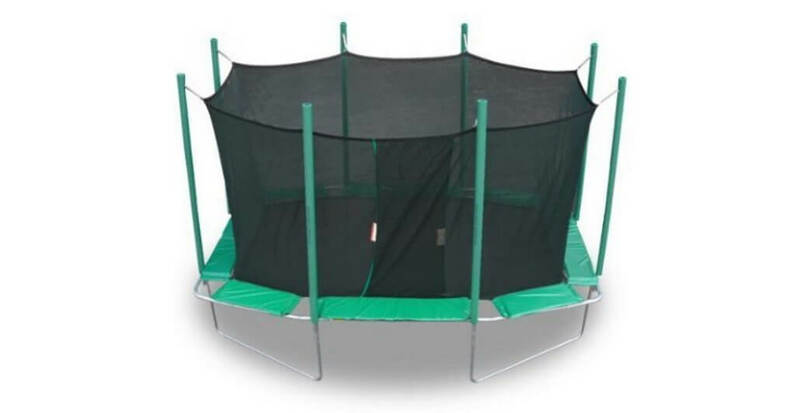 Assembly takes from 5-10 minutes, as this trampoline comes partly pre-assembled. All you need to do is unfold frame, screw legs, put safety padding and connect handle bar (with 4 screws). Assembly video available below… After that, just call your kids to try it out. 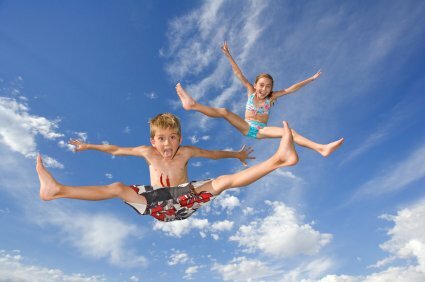 Kids game. 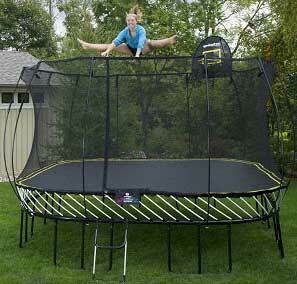 There is 1 year warranty on complete trampoline. 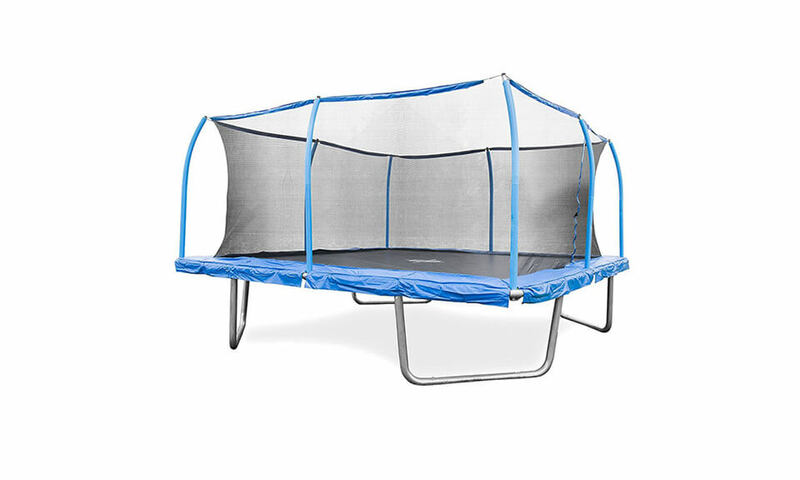 Only thing you must not forget is fill out warranty card (comes with trampoline) and send it to the manufacturer – The Original Toy Company. Interested? Buy Now! 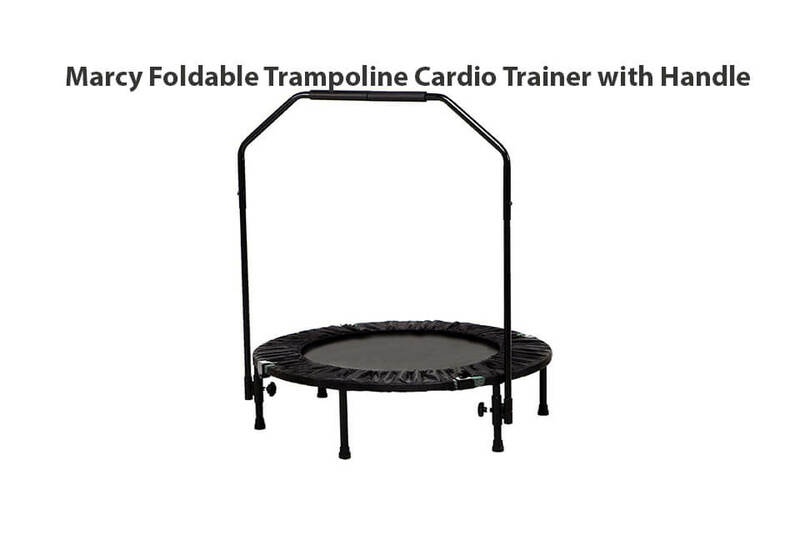 OR Check other Kids Trampolines! 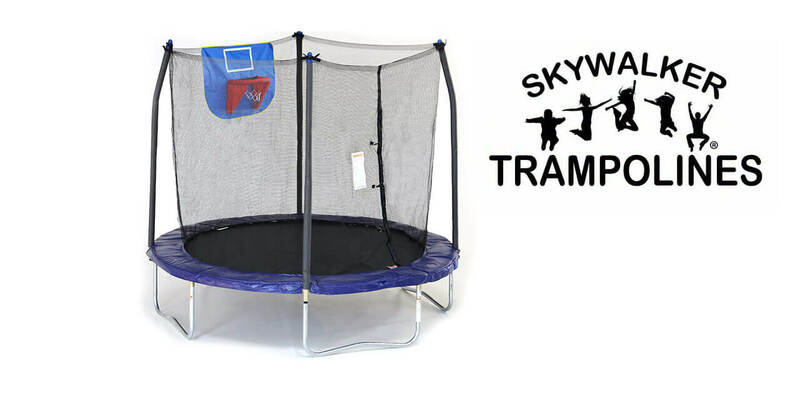 Good and affordable mini trampoline for kids, from well-known and respected manufacturer - The Original Toy Company.